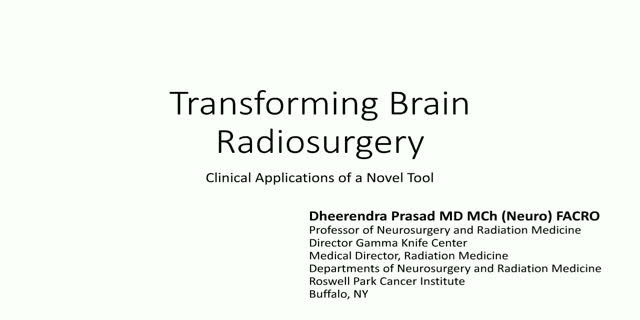 Medical doctor Dheerandra Prasad talks about clinical prospects and his clinical experience of the Leksell Gamma Knife® Icon™ for precise, frameless and frame-based stereotactic radiosurgery of the brain. Leksell Gamma Knife Icon combines the unprecedented accuracy of Gamma Knife with integrated immobilization, workflow and imaging technologies to provide even greater clinical flexibility for brain radiosurgery. This is due to a number of advancements, including on-board cone beam computer tomography, a thermoplastic mask system and an infrared-based high-definition motion-management system for patient tracking during treatment, which provide the opportunity to perform frameless and fractionated radiosurgery, as well as frame-based and single-session treatments, and to perform online adaptive planning. Based on his experience as a radiation oncologist and a neurosurgeon, Dr Prasad discusses how these novel features of Gamma Knife Icon have opened up the possibility of extending Gamma Knife treatment to more patients and new indications. He will explain how the on-board CBCT imaging capabilities of Gamma Knife Icon have improved imaging workflows for both frame-based and frameless treatments at his clinic, and how the thermoplastic mask system has enabled him to treat targets outside the range of frame fixation. He also will describe how the ability to fractionate treatments has allowed him to expand his case mix, for example to patients with tumours that are situated close to critical structures, allowing such patients to benefit from the superior dosimetry of Gamma Knife. Drawing from individual case studies and his personal experience, Dr Prasad will illustrate how Leksell Gamma Knife Icon is a valuable and flexible tool for brain radiosurgery and its role alongside linac-based stereotactic radiotherapy in today’s radiation oncology centres.